"THE RED ROSE IS A FALCON . . ."
WHAT A YEAR! SO MUCH WORK. SO LITTLE TIME. YET WE STILL MANAGED TO FINALLY RECORD AND RELEASE OUR VERY FIRST STUDIO ALBUM. AND NO HALF-HEARTED ATTEMPT EITHER. WE DID EVERYTHING JUST THE WAY WE WANTED TO, FROM THE ARRANGEMENTS TO THE RECORDINGS TO THE ARTWORK. WE REALLY COULDN'T BE ANY HAPPIER WITH "THE FALCON LIVES". AND IT DIDN'T STOP THERE. 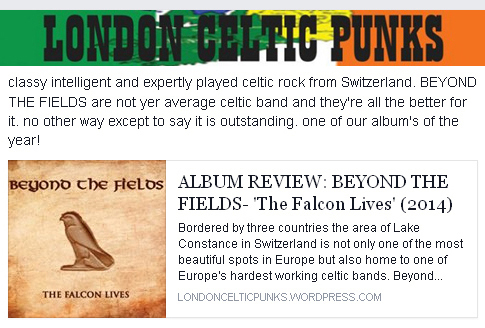 WE GOT SO MUCH WONDERFUL FEEDBACK AND SOME REALLY NICE REVIEWS AS WELL, INCLUDING A NOMINATION FOR "BEST FOLK PUNK / ROCK ALBUM OF 2014". SO, FROM THE BOTTOM OF OUR HEARTS, THANK YOU SO MUCH TO EVERYONE WHO HELPED US ALONG THE WAY, EVERYONE WHO SUPPORTED US, EVERYONE WHO LISTENED, EVERYONE WHO KEPT BELIEVING! TIME FOR OUR TRADITIONAL CHRISTMAS PRESENT THEN. THIS YEAR IT'S AN OLD LIVE RECORDING FROM BELOVED HAGENWIL CASTLE. HERE'S TRADITIONAL TUNES "THE ASHPLANT", "HANLEY'S REEL" AND "THE OTTER'S HOLT", PERFORMED ACOUSTICALLY IN JULY 2013. BEYOND THE FIELDS WILL BE BACK IN 2015, TO PRESENT "THE FALCON" LIVE AGAIN. WANT A FIRST DATE? 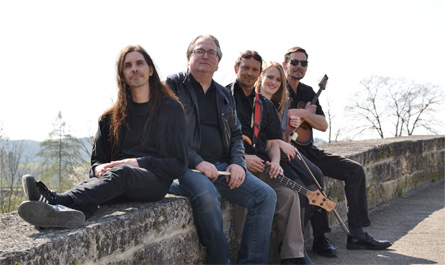 TRY JUNE 23RD, AN OPEN AIR ACOUSTIC PERFORMANCE IN THE HISTORIC OLD TOWN OF BISCHOFSZELL . . . AMONG THOUSANDS OF ROSES! NO KIDDING! WISHING YOU ALL GOOD HEALTH AND NOTHING BUT THE BEST FOR 2015 . . .
"SPREAD YOUR WINGS . . ."
FROM US DIRECTLY, OR FROM THE FINE PEOPLE AT CD BABY. MP3 FILES FROM ITUNES, AMAZON OR GOOGLE PLAY AS WELL. CHECK OUT THE SOUND SAMPLES AT CD BABY! "ABOUT 4 BILLION YEARS IN THE MAKING . . ."
YES, WE ARE FINALLY RELEASING OUR DEBUT ALBUM "THE fALCON lIVES"! aND WE ARE GOING TO CELEBRATE IN STYLE AT HAGENWIL CASTLE. SO COME RAISE YOUR GLASSES! "I AIN'T NEVER SEEN NOTHIN' LIKE . . ."